There are a few common methods of running a media bed aquaponic system. You can flood and drain it by using a timer on the pump to switch the pump off and on, while a standpipe in the grow bed controls the flooding level. You can flood and drain it using an auto siphon within the growbed and running your pump continuously. You can also run the system with a continuously flooded grow bed using a standpipe in the bed. 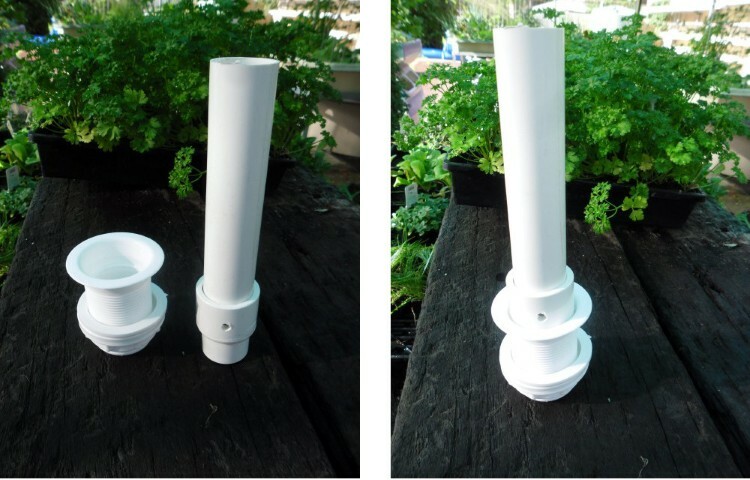 We have been running some trials of these three different methods here at Backyard Aquaponics and you can follow the results on our forum if you’d like to compare the different systems. At the time of writing this our trials have been running for over 12 months and in reality there’s been little difference at the end of the day between the three different systems. There were some differences in the early period but after 12 months there really is very little difference between them. If you’d like to read more about the Trials we ran with the different systems, we gave reports over 3 editions of the Backyard Aquaponics Magazine, with the final results summed up in the thirteenth edition. This being the case I would recommend running your IBC system continuously flooded as we have set up our IBC system on this website. Chift Pist systems are popular amongst the aquaponics DIY sector with many people. Water is pumped from the sump tank into the fish tank, this causes the water level in the fish tank to rise, flowing out into the growbed. The growbed then drains into the sump tank before being pumped back to the fish again. Uses either an autosiphon within the growbed to flood and drain the growbed or run with the growbed constantly flooded. A SLO (Solids Lift Overflow) is normally incorporated into these systems, This means that the overflow pipe in the fish tank goes right down top the base of the fish tank where it will draw solids upfrom the bottom of the tank and deposit them into the growbed. Simple flood and drain can be done a couple of ways, you can either have a standpipe in the growbed and timer on the pump, or you can use a siphon in the growbed. The debate over which method is better is a hotly debated topic and I think the answer is fairly simple, that each has advantages and disadvantages. Personally after playing with siphons on a few different systems I decided a long time ago that I didn’t want to use them, so all systems I make, use standpipes. What are standpipes you might ask? This is a standpipe. There are two small holes in the bottom of the stand pipe, this allows the water to slowly drain out of the bed when the pumps off, hence the flooding and draining action. Looks a bit similar to the one above? Yes that’s because it is basically the same as the flood and drain system above, except that when you remove the timer from the system the grow bed remains constantly flooded. Most importantly if this is getting a little confusing for you don’t worry about it, it can be difficult to conceptualize exactly how these things work, if you follow through our simple building and installation steps you’ll be able to build yourself an IBC aquaponic system in no time. 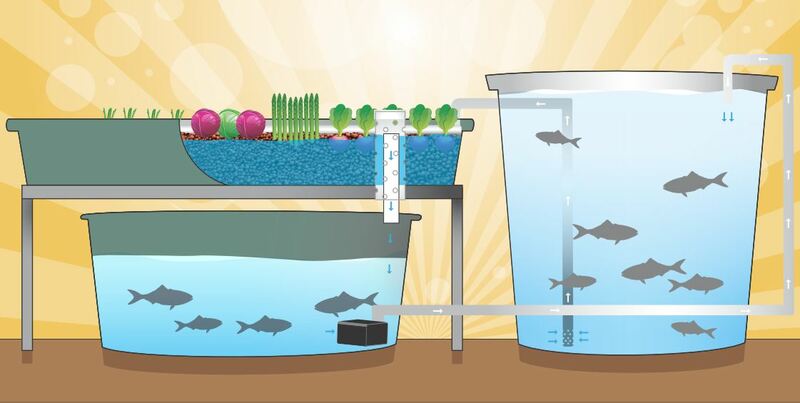 If you’d like to learn more about the different methods of setting up and running your aquaponics system, then join the forum, you’ll find lots of information on the forum.